We are a most trusted name among the topmost companies in this business, involved in manufacturing, supplying, wholesaling and trading of Solar Panel Mounting Structure. 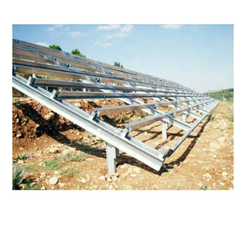 Offered Solar Panel Mounting Structure has tough construction. Solar ACDB GEESYS is a leading Manufacturer of Solar AC Distribution Box. IP65 Protected, Solar ACDB has Short Circuit and Over Load Protection, Solar ACDB has inbuilt Over Voltage Protection, Solar ACDB has Phase Failure, Phase Reversal, Under/Over Voltage Protection, Solar ACDB has inbuilt Multi Function Meter. Our company has set benchmark in offering Solar Panel Mounting Structure to the valued patrons.